Local Game Designers Show Off Their Unpublished Games! On Saturday August 9th, at noon, local game designers will showcase their latest creations at the White Widow Game Store, 4961 Socastee Blvd. 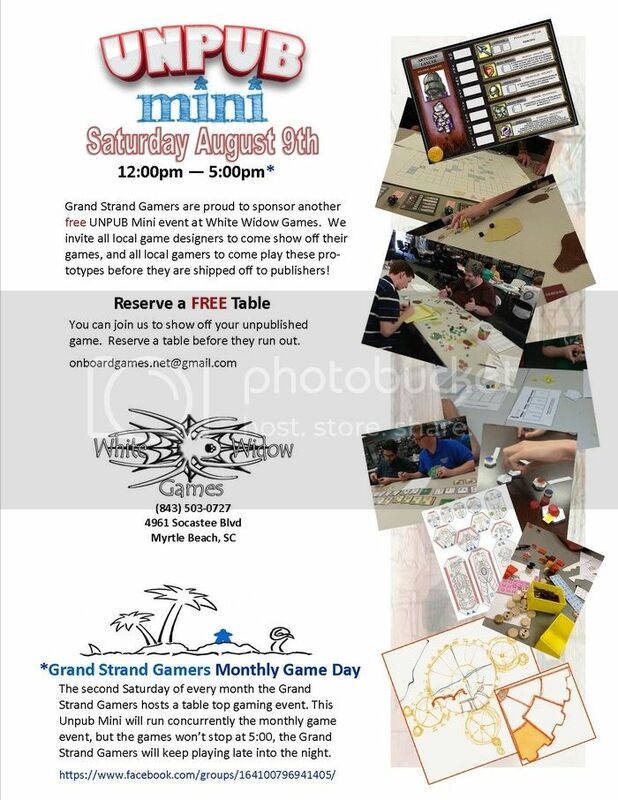 The Grand Strand Gamers and On Board Games Podcast will offer local game designers the opportunity to show off unpublished prototypes at White Widow Games, Myrtle Beach’s premier tabletop gaming destination. The public is invited to the Unpub Mini on Saturday, August 9th 2014, to share their tabletop game prototypes or play the creations of other designers. With the rise in popularity of games like Ticket to Ride, Settlers of Catan, and Magic the Gathering, more people are playing board games than ever before. Unpubs are a new movement sweeping the country as novice and experienced gamers turn their hands to game design. Anthony Hannon, proprietor at White Widow Games said “It is great that novice designers have an event tailored to their needs where they can reach out and engage the community.” By the end of the August event, designers should have a clear idea about how to improve their games or what steps they need to take before submitting their games to publishers. Head over to Facebook to check out the event details. And hop over to The Weekly Surge for their write-up about the event! To be honest I didn't observe rise in number of people playing board games. Somehow lots of people find them boring while computer games find more and more adherents. Clear idea on improvement and development is need whatever you are doing and I write my thesis online as I do not see how it can positively influence my personal development.